Galway building contractor Thomas McHugh is one of Fine Gael's four candidates in the Galway East constituency. 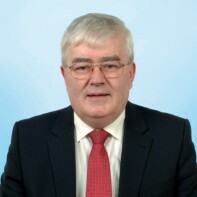 McHugh, who has been a member of Galway County Council since 1999, was unsuccessful in the 2007 general election when he polled just under 5,000 first-preference votes. He was appointed as Chairperson of Galway County Council in 2009-2010. McHugh is a former Deputy Mayor of Galway County Council. In addition to being a building contractor, he's a shop owner and employs 80 people.